The information and computer technologies (ICT) are rapidly growing. We need more powerful processors, larger data storage capabilities, and faster ways to access, manipulate and process data. This requires shrinking the size of memory and logic elements, find novel technologies to read, write and transfer information very fast and efficiently without the compromise of increasing energy and economic cost. Thereupon, spintronics comes to rescue. It is based on the idea of using electron spin as a state variable in electronic devices which have revolutionized the physics and engineering research in the last 30 years or so. Nowadays, spintronics is believed to offer the most promising solutions for the ever-growing ICT needs of memory and logic elements with ultralow energy consumption. 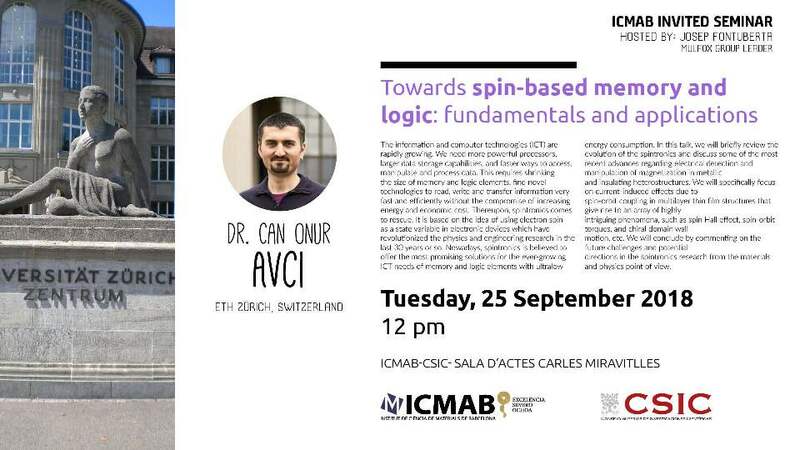 In this talk, we will briefly review the evolution of the spintronics and discuss some of the most recent advances regarding electrical detection and manipulation of magnetization in metallic and insulating heterostructures. We will specifically focus on current-induced effects due to spin-orbit coupling in multilayer thin film structures that give rise to an array of highly intriguing phenomena, such as spin Hall effect, spin-orbit torques, and chiral domain wall motion, etc. We will conclude by commenting on the future challenges and potential directions in the spintronics research from the materials and physics point of view.